Distracted drivers , particularly those who are texting as they drive, are a menace on the roads. Studies show that distracted drivers are actually six times more dangerous than drunk drivers. If you or someone you love has been injured by a driver who was texting, you know the devastating impact that such an accident can have on your family. What you may not know is that you may be entitled to financial compensation for your injuries. Each year, hundreds of accidents in Illinois are caused caused by distracted drivers. If you have been injured by a distracted driver, let our lawyers help you fight for your rights. We are the LARGEST personal injury law firm in Illinois and have successfully recovered more than $1,000,000,000.00 in compensation for our clients. While there can be many contributing factors to an auto accident, the reality is that most collisions are caused by negligent drivers and could have been prevented. It’s unfortunate that despite recent advancements in automotive safety devices like automatic braking, lane changing sensors and other accident avoidance technology, human error is still a dominant factor in almost all serious auto accidents. Have you been involved in an accident in Chicago and need effective legal advice from an experienced lawyer? At the law offices of Goldberg Weisman & Cairo, our lawyers have the resources and tenacity to see your case from beginning to end. Drivers who cause an accident while texting and driving are acting recklessly. 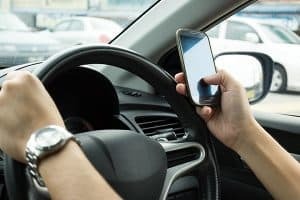 Many drivers believe they won’t get caught, but our experienced attorneys know precisely how to gather evidence that a driver was texting when he or she caused an accident. Building an excellent legal case takes time, patience and motivation. At our firm, we will use all of our considerable resources to prove that your auto accident injuries were caused by distracted drivers who were texting when they should have been focused on the roads.